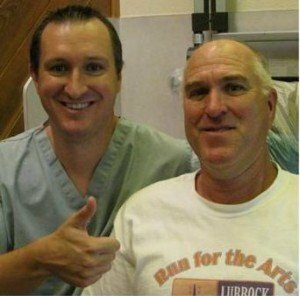 I did a “teeth in a day” procedure on my Father, Ronnie Nugent. Dad broke one of his front teeth off at the gum line. The tooth was not hurting so I had him drive from Lubbock down to Pasadena. I evaluated the tooth and the tooth was not fixable. Oral Surgeon Dr. Manuel Diaz extracted the tooth, placed the implant and temporary abutment and crown. In the X-ray you can see the titanium implant post that was inserted into the bone. The red arrow is pointing to the dental implant. Here I am checking on my Dad after the oral surgery. Dad had the dental implant placed with only local anesthesia. The Oral Surgeons will discuss with you if you want just local anesthesia or if you want I.V. Sedation. So do we look alike or what? Here is the final crown. 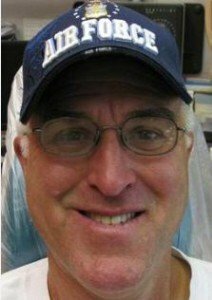 Dad has had a lot of dentistry done in his life. You can see amount of dentistry in the above X-ray. I removed the temporary crown and temporary abutment. Then I placed the permanent abutment and crown and Dad has a new tooth. He can floss between implant crown and his other teeth. He can bite normally. 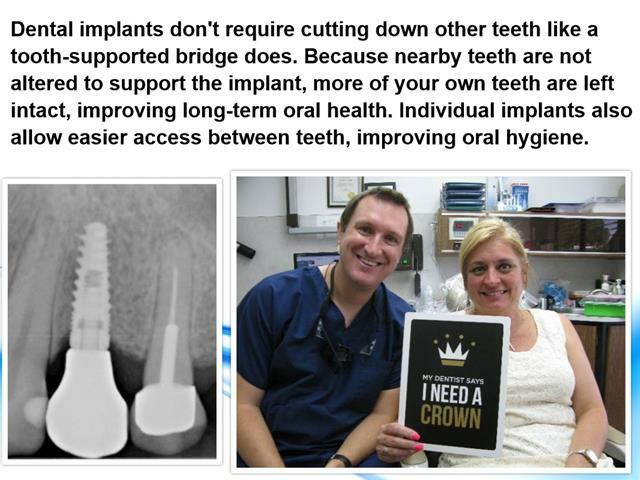 A year after the procedure I ask my Dad how he likes his implant crown. 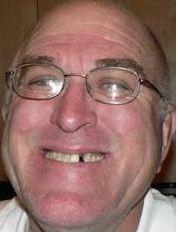 He responds “I love my dental implant, I can’t even tell it is a fake tooth. 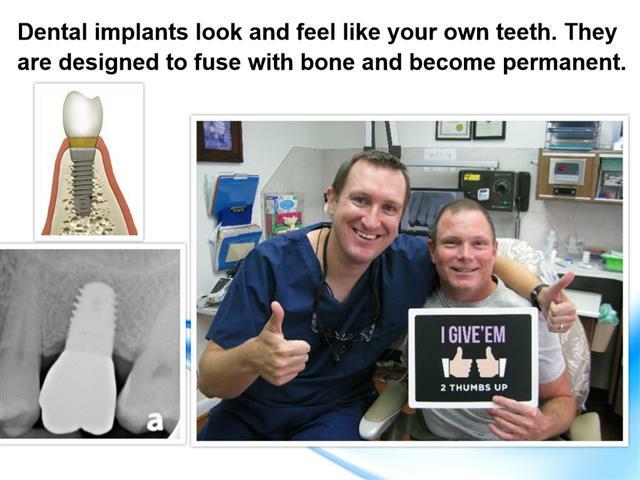 It feels great.” And that is the typical response I get from all my implant patients. Dental Implants are the absolute best way to replace missing teeth because dental implants mimic natural teeth. Dental Implants have been used for over 30 years. The first implants were crude as the science of bone fusing to titanium was in its infancy. Todays dental implants are light years ahead of the first implants. One recent survey showed that 1.5 million dental implants were placed last year. Each year that number will grow because nothing lasts longer or works better at replacing missing teeth than a dental implant. I am passionate about dental implants. I have done implants on my Father, Mother, Father-in-law, Mother-in-law, staff and friends because I wanted them to have the very best dentistry possible. 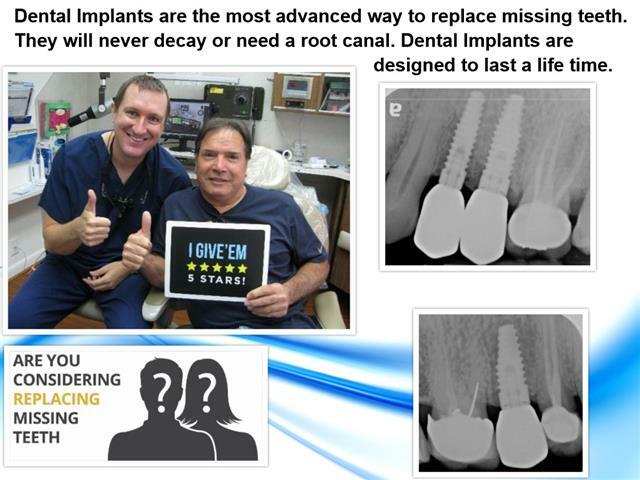 If you are looking for a regional leader in Dental Implants I invite you to call my office at 713-941-8261 and schedule a dental implant consultation. Visit our amazing dental office at 3421 Burke Rd Ste A, Pasadena, Texas 77504.